Last year's Ski-ing party left the School at 4.30 p.m. on Saturday, December 27th by coach. After the Channel crossing by boat, we boarded the sleeper train to travel to Sargans in Switzerland. We crowded onto the old bus and it climbed its way up the road, round the hairpin bends, to the Hotel Waldheim. From there we could see the beautiful mountain scenery and down in the valley, far below, the towns of Sargans and Mels. 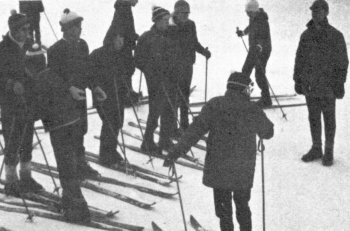 The ski-ing lessons took place at Weistannen, a resort half an hour's journey up the road. 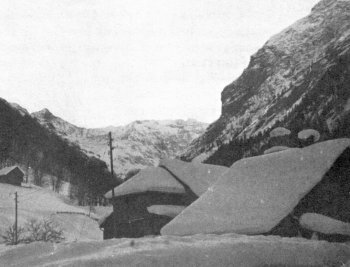 There were two day-outings; one was to a bigger ski-ing centre at Flumsaberg, where one member of the party failed to stop and so shot under the barrier ropes at the end of the slope. Luckily he grabbed a nearby post and stopped himself from landing on the roof of a car. We were thankful to leave without any injuries that evening. On Saturday, only one day before we left for home, we all went on a coach tour of Liechtenstein, Austria and Germany. 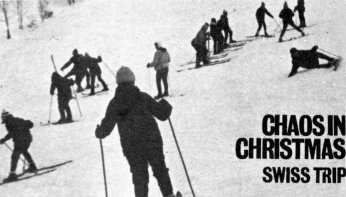 On Sunday morning, short ski-ing competition was held and, apart from afternoon Mass the rest of the day was free. Going through the Customs at Folkestone, we realised how lucky we had been. The only injury sustained by our party was a sprained ankle, but we saw other groups with us, in quite a few cases having an invalid with a broken leg. For the safety of our party we have to thank our three instructors.